Lookie what I found at a yard sale! Discussion in 'Amps and Cabs' started by StevoDOD, Jul 16, 2008. $150! Needs speakers (just picked up Jensen 50 watt mods off ebay! ), but it works! A little scratchy and was missing a tube, but it works! The circuitboard says 1990, so it' a reissue, but it's a gooder! Can't wait to fire it up with the right speakers and pots cleaned! Looks great don't change a thing. Damn, why can't I ever find anything like that?! I like it, but it won't do much to protect the speakers. I'm going with the original grille cloth. Anyone know what color that was? that is sweet! i found a '57 tweed viblroux at a garage sale in 1976 for $20. the good old days! What a great find! $150 is worth it in any condition. I'd take it to a tech and have them do a once over... it may cost you $150 but when you only put $150 into it so far thats nothing. sweet. killer score and those are nice sounding amps to my ears. I think the tie dye looks really cool personally! Stitch that bad boy back up and it will go wonderfully with the rest of the aesthetics of the amp. heheh. I'm tripping balls right now, pass the ganja, ha! AWESOME find, get a new grill cloth though. Maybe even one made out of hemp. Nice score! Are you going to put some of the original grill cloth on or keep the ripped tie-dye mojo thing? I'm actually going to put a grill, speakers, logo, and cleanup job to it and throw it on the auction site. That is unless I fall in love with it. I have a nice Carvin and Crate already (you wouldn't believe how good the Crate Club series sounds!). 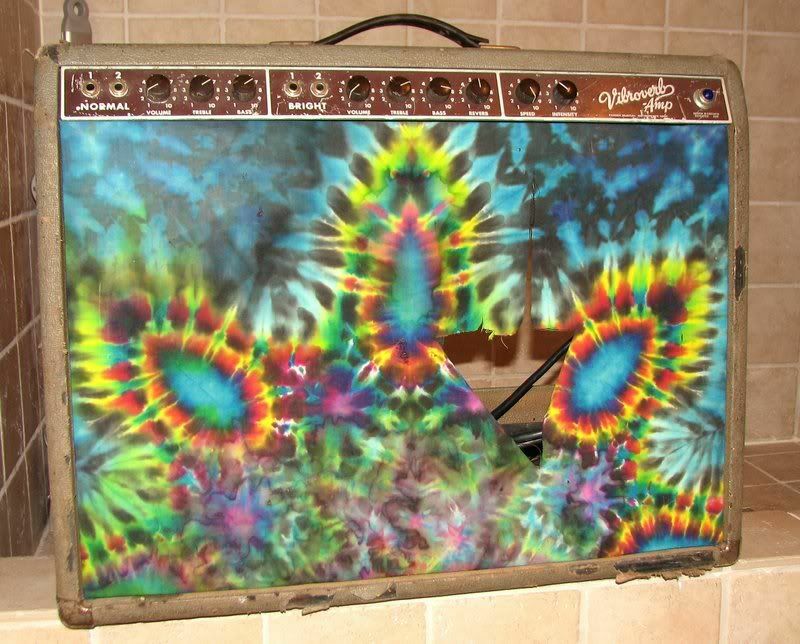 Stevo I think you'll find it a keeper, these are really sweet amps, what a score. Called "Look What I Bought Today"
A re-issue as well . . but also for a good price.